If you own a rental property, you are probably always trying to think of ways to keeps maintenance costs down and maximise your investment. One way to do this is to renovate your property so that all fixtures and fittings are as classic and durable as possible. Certain design elements create a classic home style which will stand the test of time and won’t cost the world to maintain. Installing woodern floorboards is one way to instantly update your property and make it as rental friendly as possible. Get rid of carpets. Do. Not. Have. Carpets. Carpets are bad news for property owners as they present many maintenance problems. They are hard to clean, easily stain, instantly date the property, and weather they’re light or dark are a nightmare. (Light stain way too easily and dark show up every single spec of dust no matter how minimal.) Timber flooring is a much better alternative as they instantly give your property a classic style and are appealing to renters. They are easy to clean, easy to maintain and mostly stain resistant too, so you will have much less maintenance costs for flooring with floorboards. Creating an outdoor space or room is another great way to increase the value of your rental property. 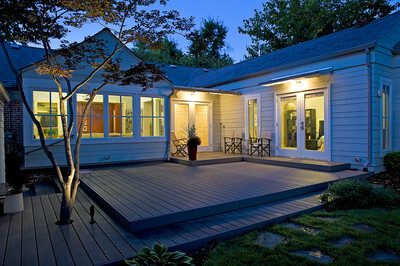 If you have outdoor space at your property you should maximise its worth by building a deck in the space. A timber deck provides an extra entertaining area and adds another outdoor room to your property’s layout. When deciding on a colour pallet for your property, ensure you use neutral colours for the walls and ceilings. Avoid feature walls as they are a dated style concept and limit the aesthetic but don’t be afraid to accent any features the property may have, like moldings and picture rails with a colour other than the one on your walls. If you have the budget for the renovations, create an open plan living area. This can be done easily by removing non-load-bearing walls in your living, dining and/or kitchen areas. By opening out the area it creates the feeling of space and makes your property seem larger, and therefore more appealing to prospective renters. To even further accentuate the size of your rooms, you should run your floorboards going from one wall to the other, on the plain of the widest distance between two opposite walls. Using these tricks to renovate your rental property can be a greatly cost effective way to raise it’s value and increase your return on investment.